The shape of the shelving unit recalls rocks rising steeply out of the sea, natural cliff faces created by the constant action of waves and strong winds. The shelving unit tells a story about nature. The angled shelves, jutting out from the uprights and producing a play of light and shade, give a new dimension to the space. 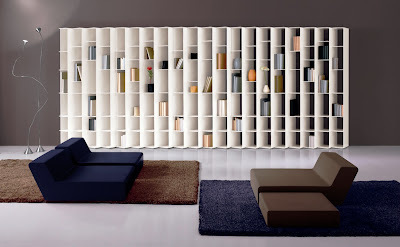 The sectional shelving unit in MDF (8 mm thick) with matt white lacquer and matt silver lacquer finish is designed for fixing to the wall (brackets provided). Each module consists of 4 oblique columns (not parallel to the wall) with fixed protruding shelves at differing intervals, and adjustable feet. 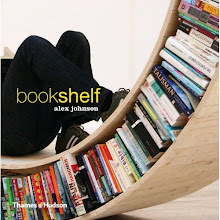 To change the oblique angle from right to left or vice versa, turn the shelving unit upside down.